Please pre-register for the workshop! HARVESTING TIME represents the end of the summer and the beginning of autumn. This is an abundant time of ripe fruits. It could also be a time when we allow ourselves time to enjoy and create. The Linocut technique requires time and focus while having a therapeutical effect, pampering the spirit and mind like meditation. The workshop is a great way to design a unique and original luminaire with the motifs that you personally like. The luminaire blanket is made from plaster, with a flat surface that each participant can decorate in a linocut technique according to his or her fantasy. The process of work begins with the design of the motif, which is transplanted to the printing plate. Next, linoleum cutting techniques are introduced, using special knives and materials. 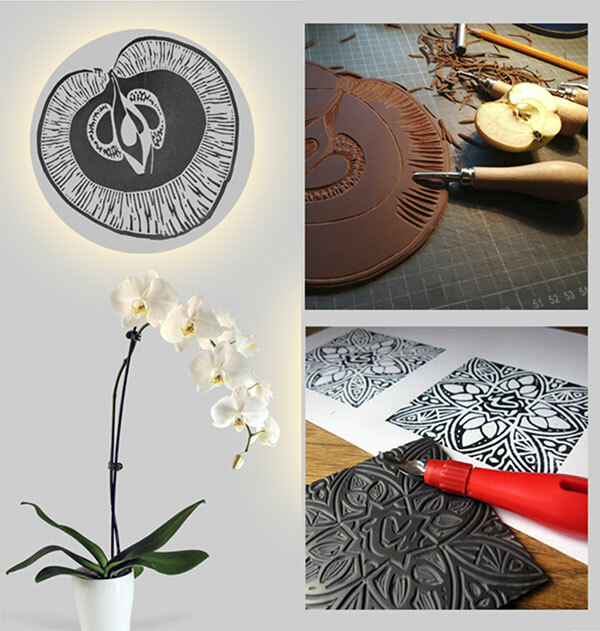 The cut-out motif is printed on the flat plaster surface of the luminaire. In addition, it is possible to print the same motif on paper using a printing press, testing different compositions and color schemes. The title of the exhibition could also be WE HAVE TIME because the linocut is a somewhat further development from the ancient woodcut technique and requires the artist to have the same manual dexterity and durability. The exhibition features graphic sheets of artists with a variety of creative backgrounds and approaches that are combined with the use of the linocut technique. We TAKE TIME to cut and thus also to look into ourselves because no work can be born without focusing on the moment when it is being born.